If the name doesn’t convince you, then simply step into the cheerful lobby lounge with all the feelings of home. Soft classical music drifts from the speakers. Here you’ll find cushy seating to curl up with your iPad to read Travelfish or use the WiFi. There’s also a long communal table, a help yourself tea/coffee station, a white bookshelf with a flatscreen TV and magazines and there’s even a piano. At the back there is a fridge with drinks and a cocktail menu. A separate entrance at the front of house leads to the dorm rooms which are cosy but thankfully not claustrophobic. The bunk beds are impressively solid pine and thoughtfully constructed. There’s a headboard and footboard to give some privacy between beds and each bed has an outlet with two plugs, a reading light and a lockable drawer underneath. It’s all feels fresh with freshly painted walls, stark white linens, some natural light and clean floors – all shoes off at the front entrance. It is not a party hostel but certainly one where you can meet other travellers. Find this peaceful place on a cosy little lane that runs off Phan Dinh Phung Street. 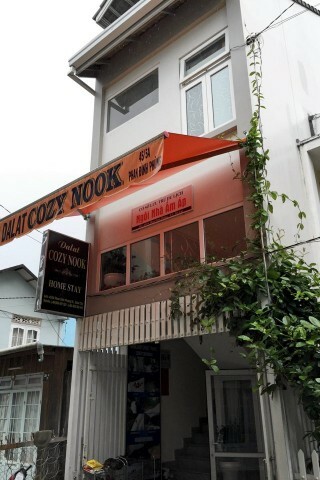 Check rates at Dalat Cozy Nook Hostel on Booking.com.